Terry Chronister, Second VP, reported 34 members in attendance for the April meeting. Can you count yourself among the 34? If not, you missed an interesting presentation on the importance of the Chouteau family in the early development of Jackson and Clay counties. Here is your warning, next month Jim Ogle of Freedom’s Frontier will present on the history of Kansas. The histories of Kansas and Missouri are forever intertwined. I urge you to come join us to discover or justify, just what is a “Jayhawk” and why would anyone want that particular symbol for their university. I’m baffled. 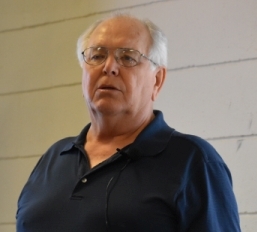 Monthly meeting program: Jim Ogle of Freedom's Frontier presents "History of the State of Kansas"
Board meeting immediately following program and refreshments. Monthly meeting program: Jim Beckner presents "The Story of the Confederate Veterans Home at Higginsville, MO"
See our Calendar for more information and other Round Table and area events. 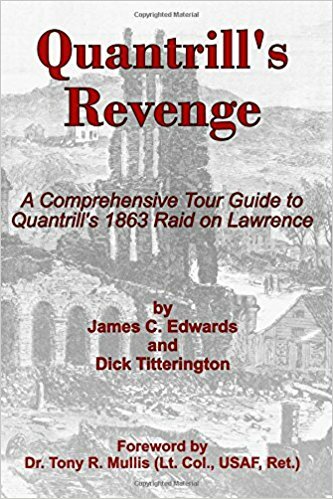 "Quantrill’s Revenge: A Comprehensive Tour Guide to William C. Quantrill’s Raid of Lawrence, Kansas"
In August 1863, guerrilla chieftain William C. Quantrill led around 400 Missouri guerrillas deep into Kansas to attack Lawrence, “the great hot-bed of abolitionism in Kansas.” Over a four-day period, Quantrill led his men over 90 miles from Johnson County, Missouri, to Lawrence where they burned much of the town and killed over 150 townsmen. 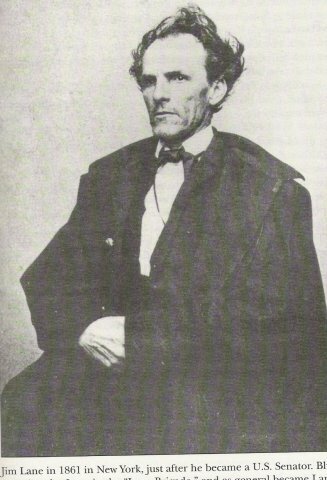 After spending 4 hours in Lawrence, Quantrill took an 80 mile route back into Missouri, skirmishing with Union cavalry along the way. This tour guide contains 49 tour stops and follows the route taken by Quantrill’s guerrillas during their 1863 raid on Lawrence, Kansas. The tour begins in Johnson County, Missouri and goes west through Jackson and Cass Counties, Missouri, to the Kansas state line. The tour enters Kansas just north of the boundary between Johnson and Miami Counties, Kansas, and continues heading northwest through Johnson and Douglas Counties, Kansas, on the way to Lawrence. As you might expect, most of the tour stops are located in Lawrence, Kansas. 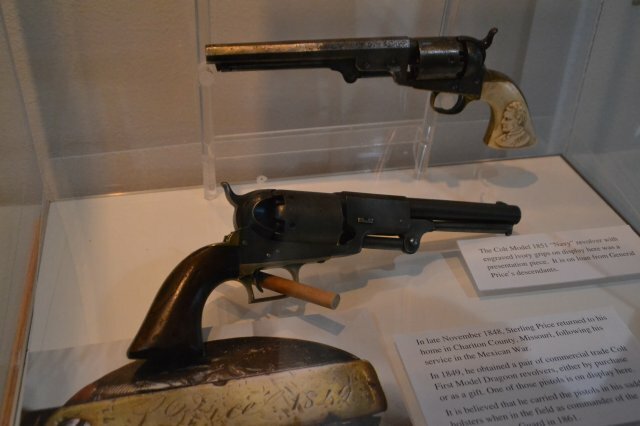 After Lawrence there are a number of tour stops following the route taken by Quantrill’s guerrillas on their way back to Missouri as they were pursued by Federal troops. Altogether the tour covers a distance of approximately 175 miles from start to finish. 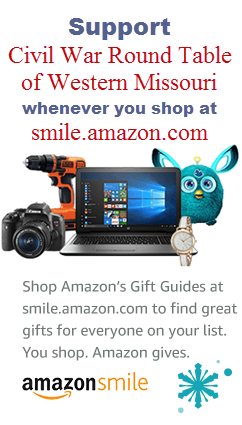 Click the AmazonSmile logo to the right to purchase it through AmazonSmile (be sure to sign into AmazonSmile) and have your order routed through the philanthropic arm of Amazon. 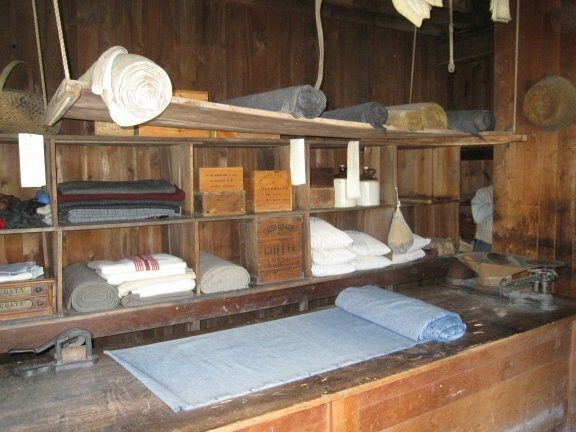 The Civil War Round Table of Western Missouri is a duly registered not-for-profit which can receive a small remittance for your order. 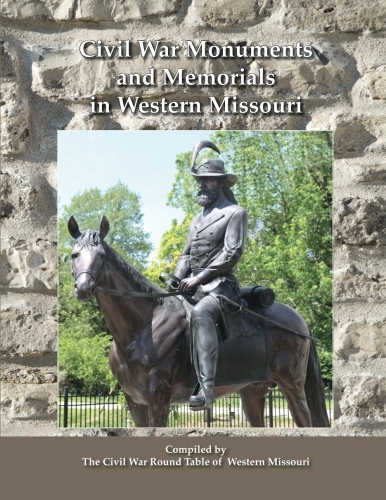 "Civil War Monuments and Memorials in Western Missouri"
Our second “Monuments” book is now available for purchase at a CWRTWM meeting or by mail. 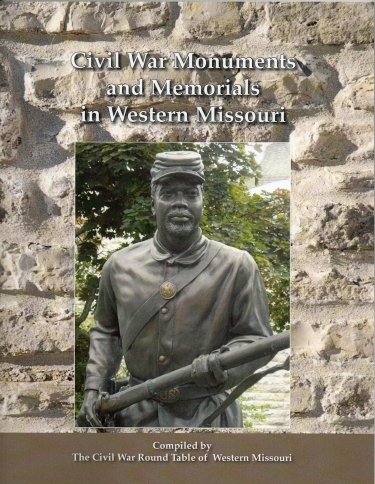 The book is called Civil War Monuments and Memorials in Western Missouri. 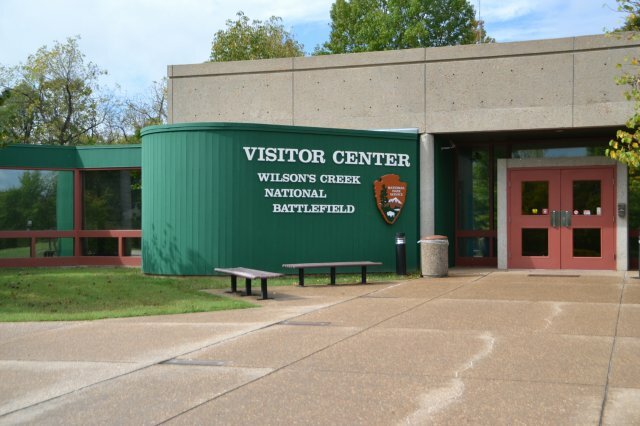 It includes sites in greater Kansas City and extends to other areas in western Missouri that could be considered no more than a daytrip from Kansas City. It is available in two different cover designs: the original "First Kansas Colored" and "Mounted Shelby". Please specify which cover you would like when ordering. The cost for this full color compilation is $15 for CWRTWM members ($20 for non-members) plus postage and handling of $2.75 per book if mailed. You may save the postage and handling by picking up the book at one of our monthly meetings. Monthly Program/Meetings – Featuring "Speaker of the Month" or "Round Table Sessions," refreshments and socializing with others of like interests. Meetings are generally held on the second Wednesday of each month. Check the Calendar to verify the date and location and find out about the next program topic. Visitors are always welcome! Monthly Board Meetings – Meetings are generally bi-monthly and held immediately following the monthly program/meetings on the second Wednesday of the month. Members can verify the date and location by logging into this site and checking the Calendar. Non-members can send an inquiry via the Contact Us page. Visitors are always welcome! The Sonny Wells Little Blue Battlefield Memorial Commission – A subsidiary Commission organized for the purpose of receiving and maintaining all real estate and monies of the Little Blue Battlefield and its memorials, setting goals, raising funds and any other purposes lawfully identified, in order to preserve the Little Blue Battlefield, located at and near the Little Blue River and U.S. Highway 24 in eastern Jackson County, Missouri. This is the publishing arm of the organization to create historical guide books to Civil War Monuments and Memorials in Missouri, normally within a 50 mile range of Kansas City. 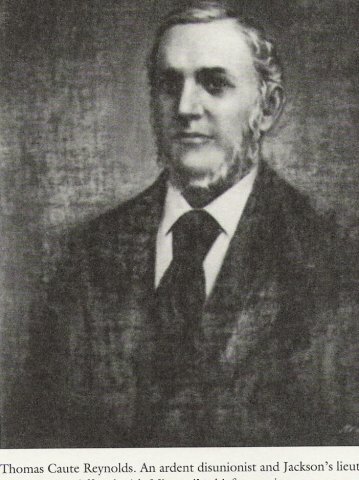 The Lewis-Gregg Cemetery Commission – A subsidiary Commission organized for the purpose of owning, operating, maintaining and funding the Lewis-Gregg Cemetery, located in eastern Jackson County, Missouri, which includes land and monies transferred from the Jackson County Historical Society in 2006, and for any other purposes lawfully identified, in order to preserve the Lewis-Gregg Cemetery. 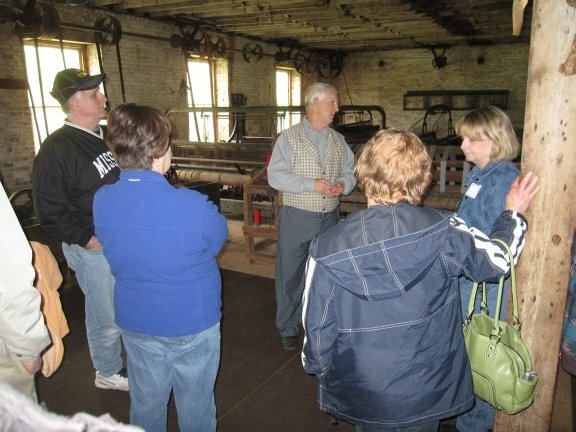 Field Trips – Excursions to local history sites, first-hand learning, refreshments. Annual Picnic – Complete with Civil War fare, when we dare. Christmas Party – Christmas feast, celebration of Christmas past and costuming, held in cooperation with the Union Cemetery Historical Society with a potluck luncheon and a speaker. 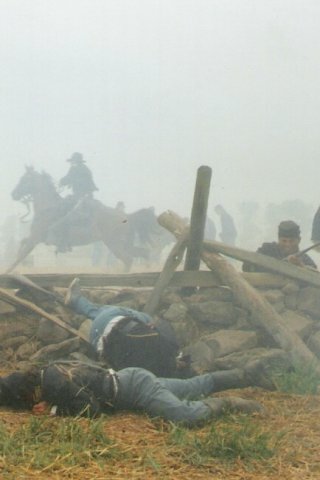 Monthly Newsletter – "The Border Star" for our members, monthly calendar items, border warfare articles, national Civil War articles, information about our members and friends. Only Virginia and Tennessee had more Civil War engagements than Missouri. The Battle of Lexington early in the war, the Battle of Lone Jack near the middle of the war and the Battle of Westport late in the war all occurred in western Missouri. The Civil War Round Table of Western Missouri studies them and more. Each month the Round Table meets to hear speakers present topics related to the war and local attractions. The Civil War Round Table of Western Missouri is a 501(c)(3), non-profit, tax exempt organization, dedicated to educational purposes including the promotion and understanding of all aspects and phases of the U.S. Civil War period, especially in WESTERN MISSOURI and the "BORDER WAR" conflict and to stimulate interest in and further discussion and study of the War Between the States. Re-enactors - (Men, women, children, and families portraying Civil War era personalities - Both Union and Confederate). Genealogists - (Family history researchers - Many related to Civil War veterans). Historians - (Veteran and novice researchers of local and national Civil War history). Preservationists - (Interested in battlefield, cemetery, monument, artifact, and historic site preservation). Teachers - (Area high school and grade school teachers and other educators). 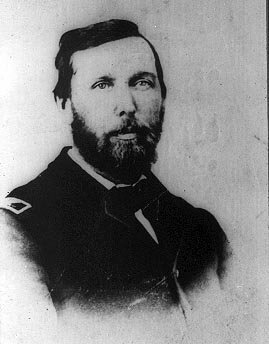 Authors - (Published writers of both local and national Civil War history). Anyone interested in Civil War history. Meetings open to members and non-members. COME ONE, COME ALL!